When you take your pet to the groomer, you expect to see certain services on the grooming menu – bathing, grooming, nail trim, flea and tick dips, teeth brushing, de-shedding, etc. At some grooming salons, you’ll see an option with which you may not be familiar: Dog paw waxing. What is Dog Paw Waxing? While paw waxing is not yet a household term, it has been used for years – primarily for show dogs and working dogs who are subjected to extreme outdoor conditions. For example, paw waxing is very helpful for protecting the paws of search dogs from cracking and bleeding due to contact with extreme temperatures. In cold climates, paw wax is liberally applied between dogs’ pads and toes to prevent snow and ice from accumulating near the skin, which can be very painful to dogs. Just as we humans sometimes get paraffin hand waxes to moisturize our dry skin, waxing can moisturize our pets’ paws, too. Unlike human hand waxing, paw waxing does not use heat. Most pet paw waxes are 100% natural (non-toxic, non-allergenic, and non-staining) and consist of a combination of beeswax, plant and vegetable oils, and plant or leaf waxes. The wax used on pets’ paws is similar in consistency to human hair wax. Your groomer will gently massage the wax on the pads of your dog’s feet, between the toes, and on the nails. Paw waxing benefits your canine companion in many ways. When the wax is applied, it forms a semi-permeable barrier over your pet’s sensitive paws. We wear shoes to protect our feet, but dogs usually do not. Paw wax provides an element of protection. Without paw wax, your pet’s paws can become damaged by abrasive concrete, sand, ice, and salt and burned by hot pavement. Besides protecting your pet’s paws, waxing also helps with traction. If your pet slips and slides across your tile or hardwood floors or has trouble navigating slippery stairs, paw waxing will give them a firmer footing. Paw waxing can be especially helpful for larger breeds and senior dogs who are prone to hip and back problems that can result when they lose their footing. 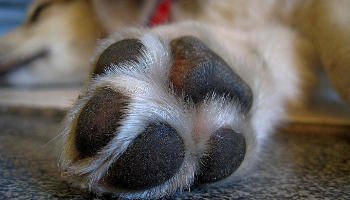 The emollients in paw wax also moisturize a dog’s nails and give them an attractive shine. Paw waxing also benefits you! Because the wax moisturizes your dog’s paws, instead of feeling rough, course, and raggedy they’ll feel smooth and sleek. That makes for more pleasant snuggling sessions with your fur babies. It also significantly reduces the odds that their rough paws will snag your clothing and furniture or carry in caked on mud and debris. Considering Arizona’s scorching summers, Central Pet decided to offer paw waxing for just $5 as an add-on grooming service. We also sell paw wax if you prefer to do it yourself. Our goal is to raise awareness of this grooming service to reduce painful paw injuries to dogs everywhere. If you’re interested in having your pet’s paws waxed or learning more about this grooming contact us at Central Pet! *This blog was originally posted on March 28, 2018, but it has been updated to the most recent information. © Copyright Central Pet LLC. All Rights Reserved.